This new image of Stephan’s Quintet is befogged with the same obsolete commentary as previous images: the foreground galaxy, collisions, shock waves, and heat. The foreground galaxy (bottom left) is believed to be in the foreground solely because of the consensus belief that redshift is a measure of distance: The foreground galaxy has a redshift of z=0.0026; the others range from z=0.019 to z=0.0225. 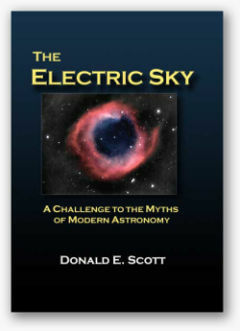 The consensual conclusion is that the foreground galaxy is 250 million light-years closer than the others. This belief in redshift as a cosmic meterstick has been disproved since the 1960s, but facts seldom affect institutionalized belief systems. Unremarked is the fact that the differences in redshift of the background galaxies place them (under consensus belief) farther from each other than the foreground galaxy is from the Milky Way. Does that make the foreground galaxy a member of our Local Group? Apparently, the illusion of foreshortening with distance works on beliefs as well. Another fact that’s consistently overlooked is that the bright HII (ionized hydrogen) regions in the background galaxies are about the same size as those in the foreground galaxy. Since it’s also believed (consensually) that HII regions tend to be of similar size, the consensus has simply ignored the fact. Perhaps the dark matter in the foreground galaxy is positioned exactly right to magnify the HII regions beyond through gravitational lensing. The long tails on both the foreground galaxy and the one immediately above it are mentioned and then dismissed as due to “complex interactions in the past.” The interactions must have been complex in the extreme to have affected the foreground galaxy. A characteristic of consensus astronomy is a flight into tunnel vision: attention is narrowed to single objects or even to parts of objects and larger connections are disregarded. So with the long tails. On deep images, both tails trail off, in parallel, far toward a large active galaxy, NGC 7331. 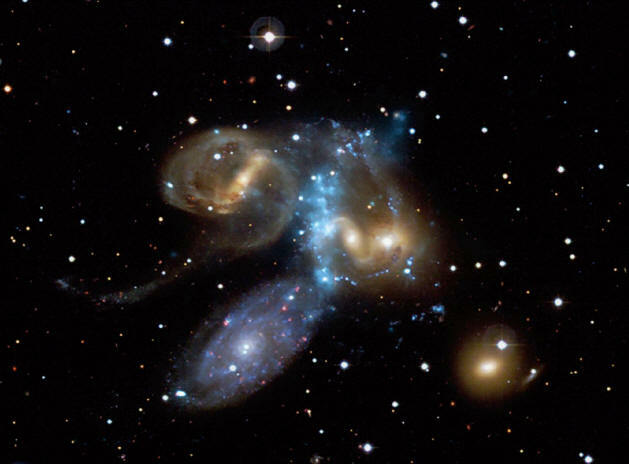 Radio observations reveal a bridge of radiation that follows the path of the tails and connects Stephan’s Quintet with the active galaxy. The bridge continues on the opposite side of NGC 7331 to a cluster of quasars, which coincidentally have similar redshifts to the high-z members of the Quintet. This is obviously another instance of paired ejection from an active galaxy. Of course, what’s obvious to one eye is not to another because eyes tend to see what they believe. It’s no shock that consensus eyes are blind to the facts of ejection pairs. Another consensual blind spot covers a high-z quasar that lies in front of the upper left galaxy. According to its redshift, the quasar should be billions of light-years behind the galaxy and therefore as invisible as dark matter. The galaxy is full of dust, completely opaque, and displays an energized region leading right up to the quasar. When scanning this galaxy, consensus astronomers blink in unison. The ridge of x-ray radiation in the core of Stephan’s Quintet is consensually ascribed to gas heated by shock waves from colliding galaxies. At 70 million Kelvin, the heating is truly shocking. Overlooked is the fact that long before such a temperature is reached, the gas has been fully ionized into a plasma in which electrical and magnetic forces dominate. The 70-million figure is an artifact of runaway extrapolation from a theory about solids. In reality, the x-rays are synchrotron radiation from high-speed electrons (an electric current) spiraling in a magnetic field. Since temperature is based on random motions and the electrons are aligned in the magnetic field, the concept of temperature is not even relevant. A final observation that appears not to have been mentioned before concerns this x-ray ridge. Stephan’s Quintet is considered to be a “compact cluster,” of which several thousand are known. 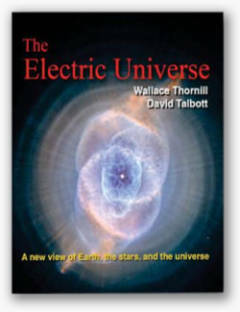 George Abell catalogued many of them before x-ray observations were possible. A review of several of them shows similar ridges of x-ray radiation across their cores (and here and here). Others show simply a spot. If these compact clusters are fragmenting quasars on their way to becoming companion galaxies around the parent active galaxy from which they were ejected, the x-rays delineate the central pinch in the parents’ ejection circuit. Ridges of radiation show up in clusters whose axis is inclined to our line of sight; the spots result from our looking “down the barrel” of the discharge.